After being landlocked my whole life, I used to never understand why people who lived so close to the ocean didn’t spend all their free time taking advantage of this luxury. But now, I am one of them! I mean, I think the closest beach is around 30 minutes away, so it’s not like it’s right in our backyard…and well, it technically is winter. (Don’t judge – I’m serious! Yesterday was only in the lower-to-mid forties!) However, we decided that since we were living so close to the ocean, we thought it was appropriate that we made our first day trip to visit a beach. 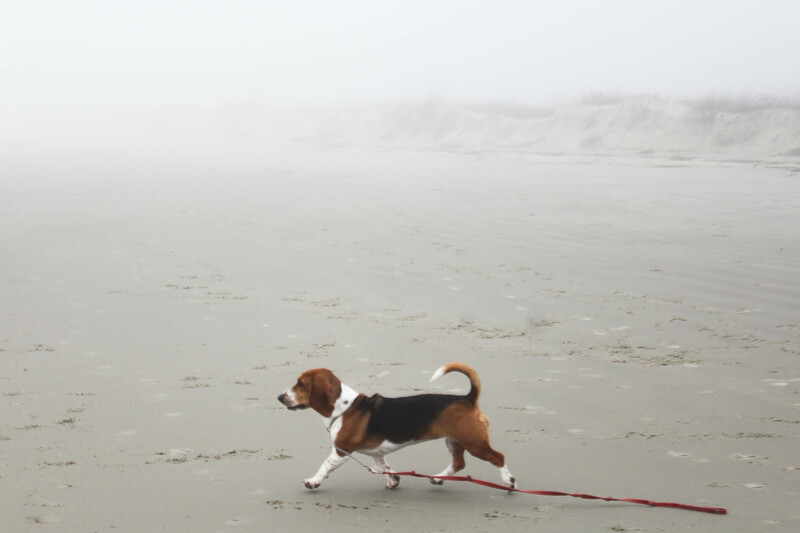 It was a little foggy in our neighborhood that morning, but it made the air warm so we thought it’d be a good beach day. However, once we were on the road, we realized it was REALLY foggy everywhere else–especially over the rivers we passed by. This still didn’t discourage us, because we had never seen the ocean in the fog before! 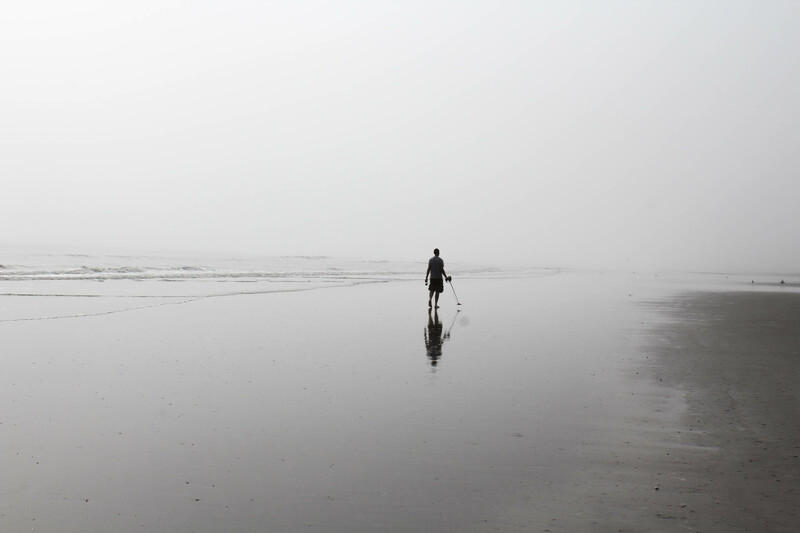 Seeing the beach in the fog did not disappoint! There were hardly any other people there, and because of the thick fog, we felt like we were the only ones. For our first South Carolinian beach experience, we decided to go to Kiawah Beach, on Kiawah Island. This is rated one of the top beaches in SC, with 11 miles of uninterrupted beach-plenty of room to wander off and get away from everyone else (or to pick the first spot you see off the boardwalk, as most people do!) We, of course, opted for a more distant, private spot off in the mist, ditched our stuff and grabbed our favorite devices to enjoy the day. For Curtis, it was his metal detector. Charlotte snatched up a ball and took off sprinting. I grabbed my camera to capture her first moments at the ocean. And there goes my handsome husband, detecting the beach. 🙂 He may not have found any cool old coins this day, but he did find some awesome shells without the detector’s help! We spent several hours there, doing our own thing and loving the day. We had a picnic and walked as far as we could with Charlotte. Just as the sun decided to show up and the beach started getting busy, we decided to call it a day and made our way back home. 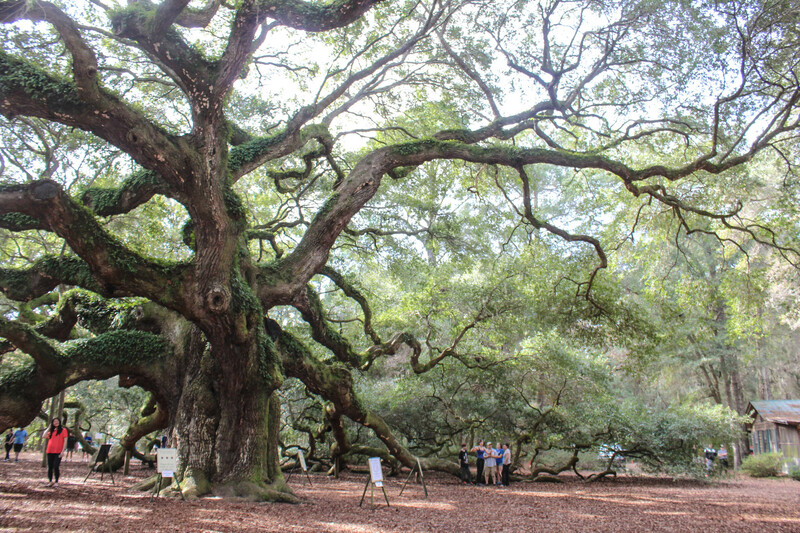 On our way back, we stopped to see the Angel Oak Park – home to the Angel Oak Tree, the “oldest living thing East of the Mississippi”! It’s approximately 1,500 years old and is a must-see in Charleston. This Tree is jaw-droppingly majestic – I had seen pictures before, but in person, it took my breath away! It’s free to visit and is on St. John’s Island, off of Main Road South of highway 17. Dogs are only allowed in the picnic area, so Curtis and I took turns walking around the tree and taking it all in. We both noted that with the huge, low-hanging branches, you would be able to literally run all the way up the tree – but of course, that’s not allowed on this very protected Oak. I have to say, I think the trees are my favorite part about our new hometown. Driving South past The Tree on Main Road/Bohicket Road was our favorite scenic drive yet – just because of the big, beautiful mossy oaks hanging over the road. We’ve seen our fair share of tree-lined or covered roads around the country, but this one tops them all. And to think it’s naturally that green?! Coming from the desert, the bright, vivid colors almost look fake! I even forgot to take pictures of this drive because it was so stunning. All in all, it was a great first day trip down here, and somehow I’m still vacuuming up sand from our fun day. 🙂 See more pictures at savingtimeinabottleimages.tumblr.com.